Finally finished! 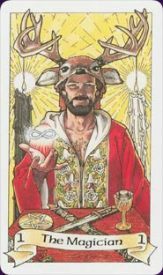 Here is a full index of the traditional Tarot deck, so you can learn each of the 78 cards. Each page describes the card, gives the basic meaning and shows a couple of examples from different decks. Next, I'll be putting together a number of Tarot spreads and techniques for reading the cards. Interested in more Tarot? You can also sign up for the 100 Days of Tarot email newsletter that I'm offering on my other site. Once you start to learn the meanings of the cards, try to do a few readings, using one of the many Tarot spreads or layouts available.